Huffle Mawson, Explorer Cat: And so farewell. Parting is such sweet sorrow. Thank you for allowing us to adopt you seven years ago, when you had spent so many months in the shelter, no-one looking at you because you were black, and shy. Thank you for making us laugh with your antics. From the time you "caught" the gecko, to the time you actually caught the dragonfly, and that one time you caught a fly with your paw and couldn't quite believe it, and lifted up your paw to check, only to let the fly get away. Thank you for always politely asking for ham (every single day) and for loving prawns nearly as much as ham - actually I think you loved prawns more than ham, but they were a special infrequent treat. Thank you for being the conduit to making so many wonderful friends all around the world. It was wonderful to see so many of your friends post lovely tributes to you on their blogs in the last couple of weeks. Thank you for being the sweetest kitty to grace our lives. Huffledad and I are going to miss you so much. Thank you to everyone for your kind words over the passing of our dear Huffle. We are just heartbroken, even more so because it happened while we were away. We take comfort in the fact Huffle was with her grandpa, whom she loved so much, at the very end. She did not suffer. And she knew she was loved for the seven years she lived with us, although we could not make up for the first five years of her life that were so hard. Huffle was a special girl, and leaves a big hole in our hearts. Teddy is adjusting to life as an only cat. He will continue blogging next year, but on his own blog: Teddy Westlife - Don't Bite. I'll be moving over his posts from Huffle's blog slowly over the coming weeks. Thank you everyone, for being our friends. We were heartbroken when we heard the news about Huffle, and felt awful that you were out of town. Healing purrs to you... know that we will not forget your special girl. We are crying all over again! We will miss Huffle so much, CC especially. She was a one in a million purrsonality. We send you our best hugs and warmest purrs. Of khourse, she was an honourary HUSKY! We are so very sorry for your loss. It is so sweet to see Huffle in her famous pot. We hope she has found one for her sunpuddle naps over the bridge. We know this has been very hard for Huffle's family. She had so many friends and she is missed! Hugs, purrs and pawtaps. We were so sad to hear about sweet Huffle. Hopefully she is playing with all her friends at the Rainbow Brigde. Tucker likes kitties if she needs a doggy friend and protector. Daisy, Leo and Angel Tucker. Thank you for sharing Huffle with all of us. She was one of our first furiends....and we loved her very much. We're sure gonna miss her. Hugs and purrs to you and Huffledad. Huffle was one of our first welcomers when we began blogging and stayed a good friend right along. We will miss him like one of our own. Oh we have been so sad about Huffle. Me and Finny and now Quill have just loved her and you. I'm glad to hear Teddy will continue the tradition. Big love and hugs to you and yours friend. We're both very sorry to hear, Huffle was a fellow black kitty, and I'll miss Huffle. Purrs to your family. Mom read us the post with tears rolling down her cheeks. RIP dear Huffle. I've rarely commented on here (but did once enter a submission into the Cat-o-Lympics in its first year), but Huffle is my favorite cat online. I am saddened and shocked to hear this news. Tears well up on my eyes as if she is my own ... Thank you Huffle for the laughs and giggles you shared online. I will miss you so much! We will miss Sweet Huffle with her clever wit, what a hole she must have left in your lives. Thanks for sharing all of her adventures with us. It must have been hard indeed to hear this when you are abroad! Huffle brightened up my life every time I read a new post of her. PS I am so glad Teddy will continue to blog, I love this little fellow! We're so sorry. What a sweet girl she was. I'm glad she didnt suffer. Hugs and purrs to you all. We were blessed to "know" Huffle for the few years we've been around the CB, and oh, how I (the human) understand the grief. I'm so glad she was able to have 7 wonderful and loving years with you. I will miss Miss Hufflepuff so much. I can only imagine how much harder it was for you both being so far away. I've put Teddy in my reader already and look forward to his goonish antics. It was with utter disbelief that we read about your sudden departure for the Bridge, and we still can't quite believe you are gone. We met you when the big parsley pot issue broke out and Angus Mhor started a campaign to get you another one. Since then, we always followed your adventures with such pleasure, even the arrival of "The Goon" Teddy. We will miss you more than we can say, but know you had a huge welcoming committee of lots of old friends at the Bridge. Teddy, we have already bookmarked your new blog. HuffleMum and HuffleDad, our deepest condolences. We are all shedding tears here for Huffle, but we know she's in a better place where she probably has a gazillion balconies with sunbeams. Thank you for sharing her with us. We really loved getting to know her and you. Soft sad woos on the passing of a visionary honorary husky kitty and member of HULA. We mourn the loss of sweet Huffle. We will always, always, ALWAYS love Huffle Mawson, coolest Explorer Cat in all the world!!! She's the bestest kit-cat friend I've ever had -- and I just know she will be with me on many of my adventures - in spirit. One single nose lick to you and the Huffledad from me, hugs from Dave, and lots of love from Mom. We're so sorry Miss Huffle has moved on. She was so beautiful. Huffle was (is?) one of kind. Always the perfect words, the special gaze, the parsley pot... We miss her lots. Not as much as you, thought. Bet the Goon misses her, too, in his own way. You and the rest of us will keep her memory warm. It is always sad when we have to bid one of our friends farewell for now. Here's to Huffle! As an honorary husky, wear your Silver Harness proudly as you head north of the Rainbow Bridge. Still teary about her over here. She was a special girl and a good friend to Edda. We are so sorry for your loss. Thank you for sharing your time with sweet Huffle with us in those beautiful photos. Many warm purrs for Huffle. I am very sad to know about Huffle. We gots all leaky when we heard about Huffle. We is glad that Teddy will keep blogging. We are very sorry for the loss of Huffle. Back in 2009, when we were first exploring the cat blogosphere, yours was one of the first blogs we visited and linked to. We will always remember, "Huffle Mawson, Explorer Cat." It was such a shock to us...and we are so honored to know Huffle. She is the reason we got our little black kitty, Salem. We are so sorry for your loss and thank you for sharing your girl with us, and the world. Farewell sweet Huffle Mawson ! I am happy that I got to meet you in pawson. You will be missed by so many - run free sweetheart. Huffle will be missed. We didn't know her as well as our sister-before-us, Sweet Praline, did, but we loved following her. The stories of the parsley pot were some of our favorites. Huffle, we will miss you so much. You know how much I looked up to you as such an experienced panther blogging kitty. It breaks my heart to think that you had a hard life before finding your forever home, but we know for sure that you found the best home ever. You were loved by your family and by your furriends who are all over the world. Thank you for loving Huffle so much and so well. She had such a wonderful life with you there, and we thank you for sharing her with all of us. Fly free, Huffle Mawson. We love you, and look forward to the day we meet again. I am so very sorry for the loss of your sweet beautiful Huffle. Thanks for sharing her with us. oh, i simply can't believe she is no longer with us. RIP miss Huffle, i shall always remember you. It is so hard when they leave us. That Winnie the Pooh is a wise bear. Thank you for sharing Huffle with us. I will miss her; but, not I am sure, as much as you. She may have had a hard life in the beginning; but, you gave her many years of happiness in a warm loving home. I am so sorry you had to be away when Huffle left for the Bridge, but glad she had someone she loved nearby. brandi has no doubt met her and they are playing together and watching over their loved ones back here. We'll be checking in on Teddy, and hope he won't be too lonely and sad. We are all so very sad about Miss Huffle. WE will always remember that sleek beauty. WE are so glad we knew you, farwell for now. We will always treasure our memories of Huffle. We miss her too. You have our deepest condolences. As we said earlier, Huffle was one of our very first blogging friends and we are eternally grateful to have known our Honorary Siberian friend. I wanted to send my condolences again to you. After losing Mocha last year, I know how hard this is. Huffle was ever so lucky to have had such great parents these last 7 years. I'm so happy she loved her grand-dad and was with him when it was time to go. Dear sweet beautiful Huffle, I will miss you, and your reports and observations. You were such an astute cat. I thought that from time to time you may have been a little hard on Teddy, but he probably deserved it. Rest well sweet girl; I imagine you chasing butterflies in a lush green field of flowers. Huffle was lucky she found you, and you were lucky that you found her. A fortunate cat and a fortunate family, too soon parted. We really miss Huffle too. We think she is with Diamond. We are so sad to read of news of Huffle. We have been off line for a few weeks (computer issues). She was one of the first kitty blogs we followed. It was so neat to have a kitty friend "down under". May your hearts be comforted to know that Huffle is warm and happy at the bridge. You will see her again. Will continue to follow Sir Teddy's adventures. We are very sorry to read about Huffle. We will miss her much. Of all the kitties we have met on the blogs she was the most polite and fun kitty we had ever met. We know how hard this has been for you. What a lovely post, she will be missed. Woody, Patch and Verity and us were so sad to hear of your going over the Rainbow Bridge but we know that you are a happy kitty and that we will meet again. Woody, Verity, Patch and the humans. Thank you Huffle for being my very first friend in the cat blogosphere! I will miss your generosity and your special, understated kitty presence so very much. Huffle was one of our first and favourite blogging friends, a lovely ladycat who made us smile every time we visited. We like to think she has been reunited with her parsley pot at the bridge. Teddy you great big goon, you're really going to have to step up now. They are some super big shoes you have to fill. We're so sorry to hear of your passing. We want to thank you too. For being such a good friend. For all your funny posts. For all your witty comments. Do you remember that you and Olivia had the first white whisker at all most the same time? We'll keep you in our hearts. Keep exploring. We are sorry to read about the passing of Ms Huffle. She was really so sweet and we will miss her. We are sending you lots of hugs. Oh no! I'm playing catch-up and just reading this for the very first time. I'm so sorry about Miss Huffle. I loved reading about her wonderful adventures. I hope the Goon is adapting to his life as a single kitty. Men my mom-persons hearts ache for you at this loss. Oh Huffle, you will be missed. We haven't been keeping up with our friends lately as much as we'd like, and just checked in to read the news... we are so shocked and sad to learn of Huffle's passing. Sending all of our purrs and love to Huffle and her friends and family, she has always held a special place in our hearts. We miss Huffle Mawson very much but know she is enjoying endless ham and sunbeams, and visits with Suka. Oh No !!!! Miss Huffle !!!!! I'm so so sorry. I didn't know. My mom didn't check anything for so long. I couldn't put into words. Me and my mom are very sorry. Miss Huffle is so special. Me and mom is always love her. Time will heal your soul, Mom Tracey. Many hugs to you and family. I'm so sorry, I only just found out as I've not done a lot of blogging since Ailsa left as it makes me so sad when our favourite blogs lose there "owners"
Miss Angel Huffle, I miss you so much ! Happy New Year to you and your lovely family !!! I hope you don't mind me to give an award to Mr. Goon to continue your blogging. Please remind Mr. Goon, he has the big next thing to do. So sad to hear about your dear sweet Huffle. You loved her so and her you. One day you will meet again. *tears* We just found out about sweet Huffle crossing the Bridge. We are so sorry for your loss. 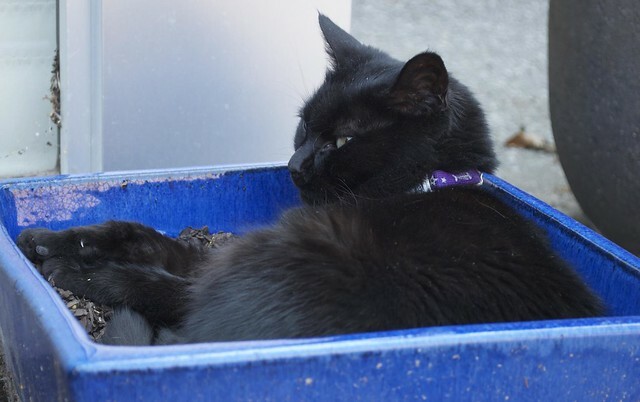 My furblings and I fondly remember the "Re-Pot Huffle" campaign when she lost her original pot to lay in! We don't get to visit blogs as much as we use to. Huffle with be missed. We stops by again, to tells you we are thinking of Huffle and her family. We hope your healing continues. We will never forget your sweet girl. We are grateful that you shared her through stories and your beautiful photos. Huffle! My heart breaks and rejoices at the same time. We will miss you so much here but you are in a wonderful place with all your great friends at the same time. Take care of your mum and dad we know you are always watching over them. Huffle! You were very loved! My heart breaks and rejoices at the same time, it breaks because we will miss you here so much. But it rejoices knowing you have gone to a wonderful place with your friends. I know you are always watching over your Mum and Dad, take good care of them like you always have. We will send them lots of purrs as well. I too miss you. Sometimes when I look at the stars, I find that I see among them. Diamond really loved Huffle. We think they are together with all their other friends. I was just thinking of you Huffle. The tears come back so quick, I hope you are running free and waiting at the bridge when your friends come too. I miss you as I'm sure your humans do too. purrrs. I am so sorry to hear about Huffle. He was one of the reasons I started a blog. I hope Teddy will post on Huffle's blog. He is a very handsome boy. Hi- just wanted you to know I was thinking about Huffle and wanted to come and pay a visit. Lovely to see the pictures again. Purrs. Still thinking of you and missing you.